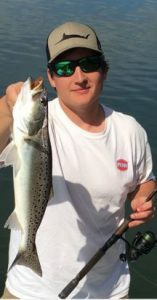 Anglers fishing inshore are reporting quick improvement now that we are in a stable warm weather pattern. There have been plenty of red and black drum hanging around docks in the creeks and waterway. Live mud minnows and cut shrimp have been the most productive baits, though Z-Man and Berkley Gulp! Soft plastics will work too. The redfish that have been on the flats in the marsh will start to spread into more areas this month and will also start to break into smaller schools as the water warms up. The big bluefish have been among the most common and cooperative species in the area, look for them in the creeks and around the inlets. They will hit top water plugs, swimbaits, and spoons. If you are going to target them, a wire leader will help you land more fish and lose less tackle. The first decent numbers of small flounder, with keepers mixed in was also reported recently. The big blues have also been biting well in the surf. Most of the fish are being caught with cut mullet; however spoons and topwater poppers will also catch fish. Some sea mullet, small croaker, black drum, and smaller bluefish are being reported in the surf now. There are a few slot-sized, red drum being caught around the inlets on cut mullet. The Spanish mackerel bite is starting to fire up now. Most of the fish have been 3-5 miles off the beach. There have been a few 3lb fish mixed in, but also a lot of smaller ones. The usual spread of clarkspoons and #1 planers has been producing fish. Yo-Zuri deep divers and Bluewater Candy Spanish Daisy’s have been good as well. Now is the time to go Atlantic Bonito fishing if you’re planning to give it a shot, they won’t be around our area much longer. They will usually only stay on the surface for a short time after sunrise and then the schools will go down deep. Casting jigs can be thrown to fish on the surface or vertical jigged when the fish go deep. Most of the Bonito are being caught by anglers trolling with planers and spoons. Cobia season is now open in NC state managed waters, which is from the beach out to three miles. It is still early for them, but now is the time to check out the new regulations and get your gear ready. Grouper season just opened on May 1st, there should be some Gag grouper biting in the 15-25 mile range and Scamps and reds in the 40+ mile range. King mackerel have biting around the ledges in as shallow as 70ft of water, and they will continue to work inshore. They are mostly being caught by anglers trolling cigar minnows or drone spoons on planers or downriggers. Gulfstream fishing has still been good, although reports were mixed this week. Some boats had great days and some only picked at the fish. If you go, be prepared for blackfin tuna and a handful of yellowfin tuna to still be biting. Wahoo have still been around in good numbers and can crash into the spread at anytime, although a planer rod will usually catch most of the wahoo. Sailfish are always a possibility, and you can expect the mahi fishing to pick up this month as well. Trolling ballyhoo skirted with JR Ilanders, Ilander Sailures, and Blue Water Candy Seawitches accounted for most of the fish. Trident Lures, Cedar plugs, and Green Machines accounted for a share of fish as well. Matt Gentry is the Business Manager of Tex’s Tackle & Bait Shop at 215 Old Eastwood Road in Wilmington. Contact Matt at 910-791-1763 or info@texstackle.comcom.